Without any doubt, lentil soup is my hands-down favorite kind of soup. I have multiple favorite recipes and rotate between them, but I’m not fixated on only those recipes and often try something new. 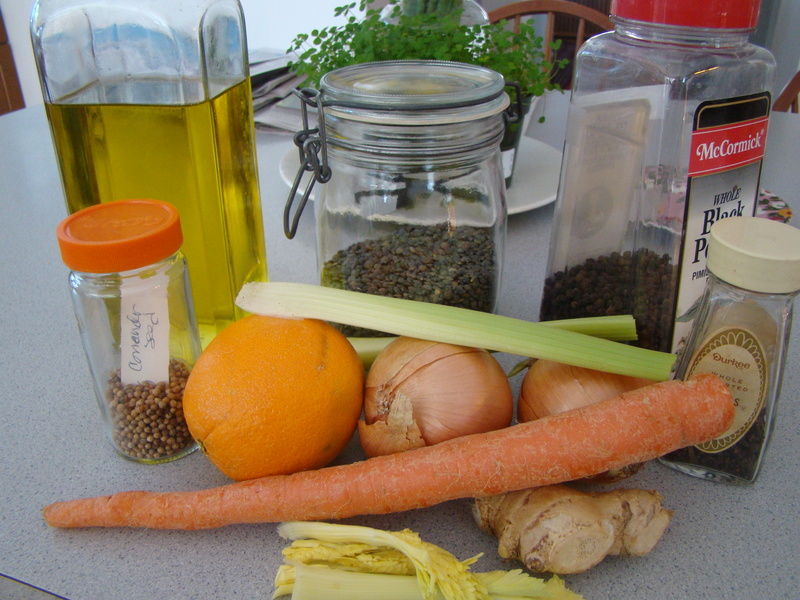 This week’s recipe for French Fridays with Dorie is yet another variation on lentil soup: Orange-Scented Lentil Soup to be more specific. The basic recipe was typical, but this version’s flavorings were a little exotic. 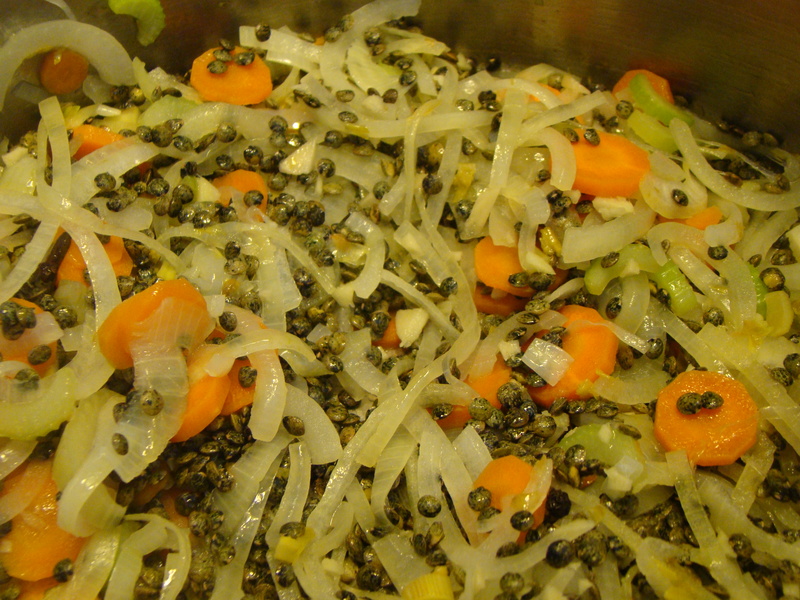 Dorie adds orange peel, chopped fresh ginger, coriander seeds, peppercorns, and a clove. This wasn’t my favorite lentil soup ever. I doubt it will make a repeat appearance in my kitchen. It wasn’t bad, but it just didn’t wow me. The only liberty I took was to use just a quart of chicken stock because I know the soup recipes in this book can be too thin for my taste. For one thing, this soup is pureed. I prefer whole lentils in my soup. Also, I used an immersion blender because Dorie said it would be chunkier that way. However, I had my usual trouble with that tool. It never seems to do the job I want. I never get the pot size right and usually make a big mess and cover myself and the stovetop with soup.. In addition to not liking the lentils pureed, another problem was that the immersion blender left noticeable pieces of orange peel and ginger and didn’t do anything to the whole spices. I didn’t really like the surprise of an entire coriander seed or peppercorn as I swallowed a spoonful of soup. 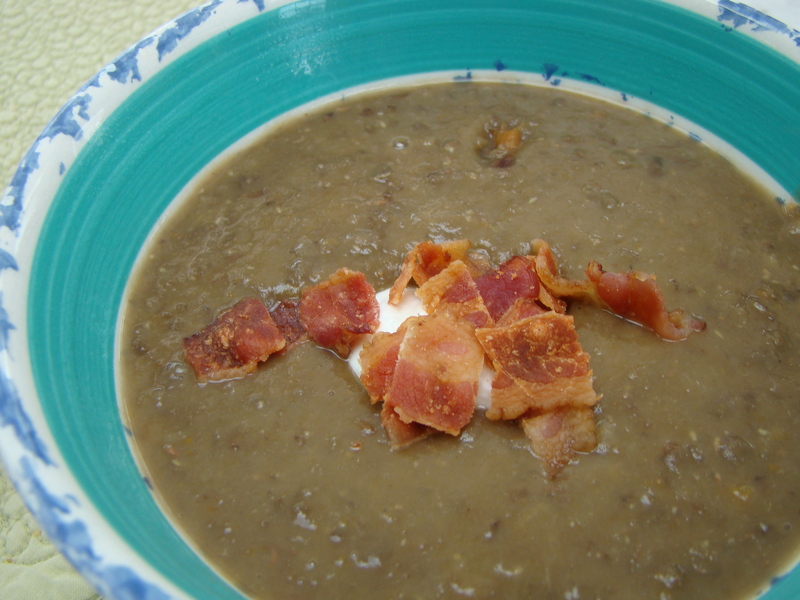 I served the soup topped with a dollop of yogurt and some crumbled bacon, yet even the delicious toppings didn’t make the soup a winner. (Note: if you want to try a winner recipe, check out the recipe for Spanish Lentil and Chorizo Soup in the most recent issue (March/April) of Cooks’ Illustrated magazine. It’s excellent. You can find the recipe in Dorie Greenspan’s book Around My French Table. I also found the recipe on-line here. To see what other bloggers thought of this week’s recipe, follow their links here. This week’s recipe for French Fridays with Dorie was a nice surprise. Cheesy crème brulée is a savory twist the classic. 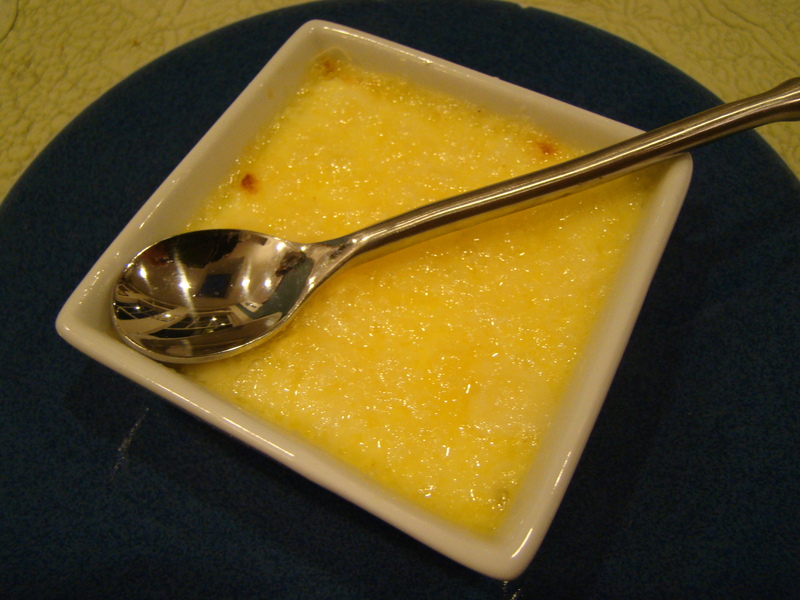 No sugar added, with grated cheese serving as the brulée. This recipe was very simple to put together. Hot milk and cream is slowly whisked into beaten egg yolks. 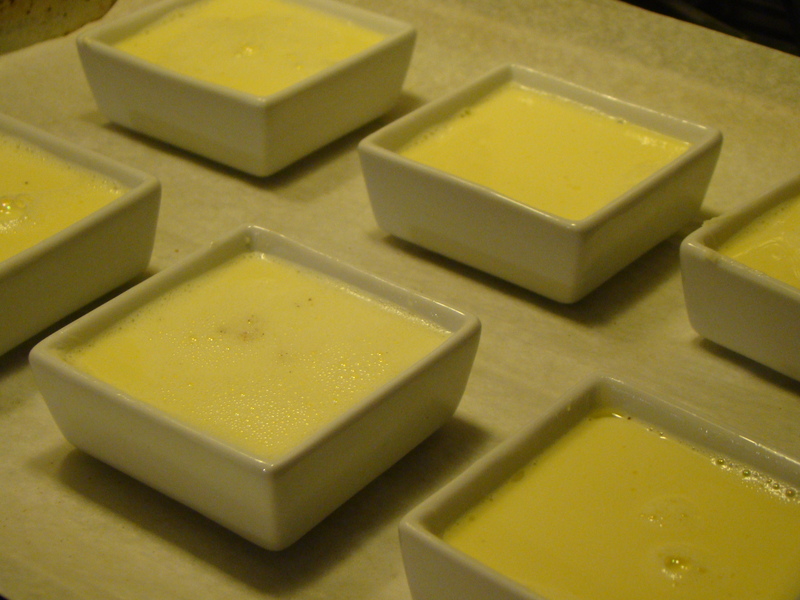 The custard is poured over tiny chunks of cheese arranged in baking dishes. Dorie recommended Parmesan and Comté (the French version of Gruyère), with cheddar suggested as an acceptable substitute. I used a new blended cheese I’ve been enjoying from Trader Joe’s. 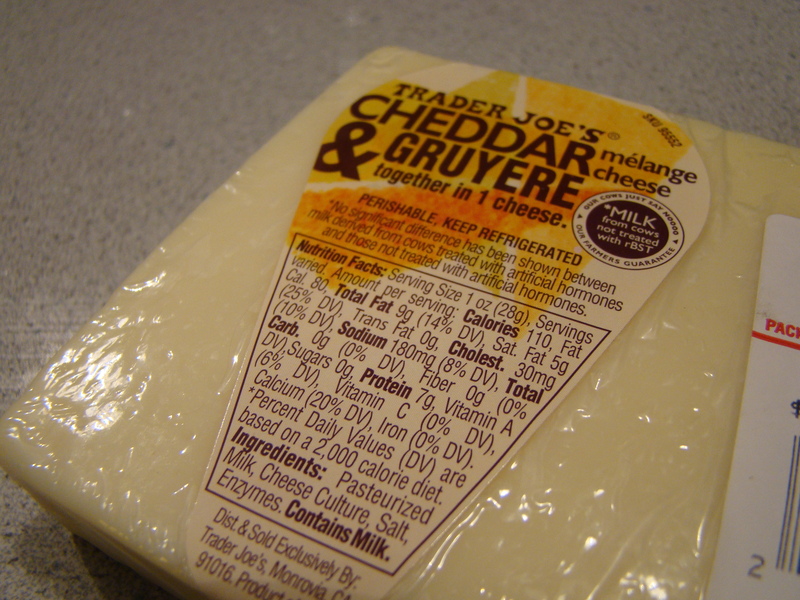 It’s a mélange of Cheddar and Gruyère. It hit the spot. It’s great for snacking too! I used this recipe as an excuse for some new baking dishes. I planned to get a set of what I think of as classic crème brulée dishes, white porcelain, shallower than ramekins, with a fluted edge. The store I went to was out of them, though the guy at the store said he could get them for me “in a few days”. I couldn’t wait, but did find these 3-inch square baking dishes with the right depth. My cheesy crème brulées looked très elegante, and I anticipate using these dishes again and again. I love anything creamy or cheesy. This appetizer being both, it was no surprise that I enjoyed it. I particularly liked the custard hiding under the layer of melted cheese. Howard liked it too and thought it would be interesting to try for breakfast. I like that idea. There are still a couple left, so I’ll see how I can work it into Saturday or Sunday’s breakfast this weekend. Cheesy crème brulée with a bowl of soup will also make an excellent lunch on this unexpectedly snowy March day. Today I find it hard to believe that the Vernal Equinox and spring is less than two weeks away. I couldn’t find this recipe on-line already, and we don’t post the recipes for this group, but you can find it in Dorie Greenspan’s book Around My French Table. To see what my Dorista blogging friends thought of this recipe, check out their posts here.